Our experiences with Aldi breakfast foods have been mostly positive; we think Aldi can do a pretty legitimate imitation of a fast food breakfast. From the eggs to the hash browns, Aldi has a good selection for the first meal of the day. When it comes to breakfast sandwiches, we prefer to assemble them ourselves, baking the biscuits (or toasting the muffins), heating up the sausage patties, and adding the cheese. But sometimes life doesn’t allow for that kind of pace, and in those instances Aldi carries a variety of ready-made, heat-and-serve sandwiches. Some of Aldi’s sandwiches are sold through the Fit & Active house brand, while others are sold through the Breakfast Best brand. The Breakfast Best sandwiches, at the time of this post, included a ham, egg, and cheese muffin and a sausage, egg, and cheese biscuit. We took a look at the sausage, egg, and cheese biscuit. 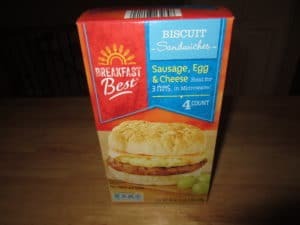 The Breakfast Best Sausage, Egg, and Cheese Biscuit, found in the frozen section, is sold in a box containing four sandwiches. They retailed for $3.49, or about 85 cents a sandwich. This is more expensive than it would cost to make them yourself, but it’s also considerably less than most fast food restaurants. They come wrapped in individual plastic bags. A microwave is required to make these; there are no other cooking instructions. (The microwave instructions are based on a 1000 watt microwave) Cooking them involves, first, pulling the sandwich out of the plastic wrapper and wrapping it in a paper towel. This little detail is important, because if the sandwich isn’t properly wrapped, it will dry out and get stone-hard when you pull it out of the microwave. Because a paper towel can come unwrapped during cooking, and because you also have to flip the sandwich during the cooking process, I like to put a small piece of clear tape over the paper towel to hold it in place. From there, cooking is a two step process: heat 90 seconds at 30% power, then flip and heat 90 seconds at 100% power. (To do this, you’ll have to figure out how to do 30% power on your microwave, which can be a bit of a chore if you don’t do it often.) Then let the sandwich sit 90 seconds in the microwave. Be careful when you remove the sandwich from the paper towel, as it will be hot. Also, the cheese tends to stick a little to the paper towel; this is something I’ve seen with other frozen sandwiches, and short of trying to fold it inside the biscuit before cooking, it’s difficult to avoid. Tastewise, the sandwiches are fine. The egg, cheese, and sausage are all pretty good, as is the biscuit. The sandwich isn’t huge, but it’s large enough and filling enough for a modest breakfast, and of course it can easily be paired with other breakfast fare if you need something more substantial. 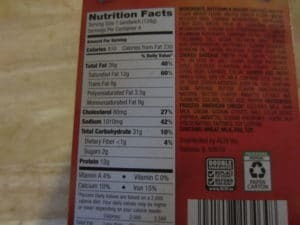 Nutritionally … well, these are not good for you. 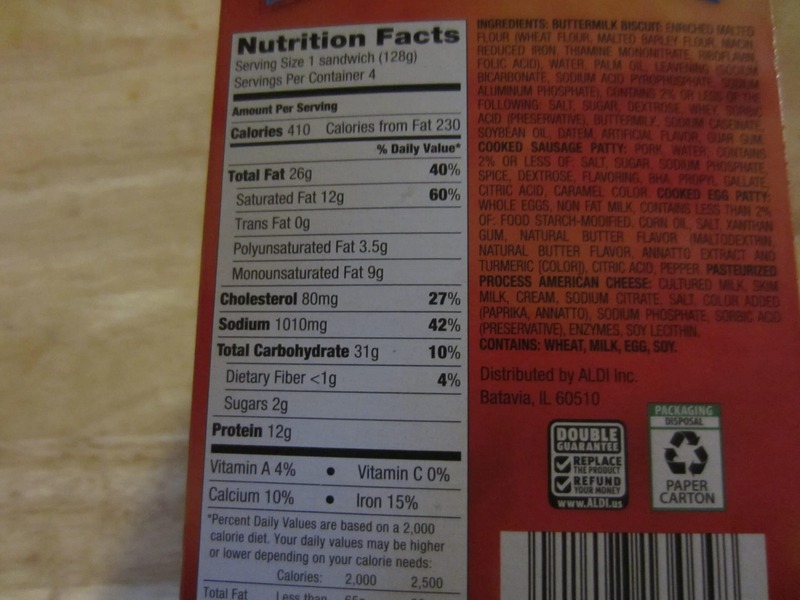 Each sandwich has 410 calories, plus 40% of the daily allowance for fat (and 60% of the daily allowance for saturated fat), 27% of the daily allowance for cholesterol, and an astounding 42% of the daily allowance for sodium. They do have 12 grams of protein and a bit of calcium, iron, and vitamin A, but beyond that these are more of a comfort breakfast food than a healthy start to the day. These sandwiches taste pretty good and heat up in just 3 minutes, but they’re high in fat and sodium and the cooking requirements involve fiddling with your microwave cooking power. We prefer to make our sandwiches ourselves, but if that’s not an option these can work in a pinch. These BF sammies are VERY GOOD! They are MUCH cheaper than getting at lets say MCDs or a Speedway gas station for like $2.30 each! I also compared this Aldi version to Jimmy Dean’s I picked up at Walmart…JD was may a few cents more. MAJOR DIFFERENCE! Not only is the Aldi sausage tastier (and slightly thicker) than JD…JD sausage is SALTIER! Aldi beats the name brand! I wanted to know if Breakfast Best Pork is ever connected in any way to China! I am trying to avoid any chicken or pork that has any connection with being processed in China, even if I have to give up breakfast sandwiches all together. I already avoid McDonald’s pork and chicken products, Kentucky Fried Chicken, and Jimmy Dean Products. Join me and please keep me informed.